I love spicy food, particularly that old favourite: the Friday night curry. However, getting into a food-rut is never a good thing so it was a pleasant surprise to discover that beyond the poppadoms, samosas and pakoras, Kashmiri Kitchen’s menu is slightly more unusual than many of the spicy-food establishments in the steel city. The Ecclesall Road venue has a surprisingly limited menu of seven intriguing main courses: Choosa Handi (chicken), Gosht Handi (lamb), Keema Mutter (mince), Chicken Pilau, Aloo Gobi (cauliflower and potato), Tarka Daal (lentils) and Kashmiri Bhindi (okra.) Surely a restaurant that has the confidence to offer just seven mains, must really excel at those few dishes? Upon entering the restaurant, first impressions were good as the reception was very polite and efficient. Kashmiri Kitchen do pack in the tables, but we’d nabbed a window seat so at least we weren’t disturbed by people squeezing past. Our drinks orders were taken immediately, and the drinks themselves appeared just a few minutes later. So far, so good. Despite the speedy service, the no-frills menu meant that we’d settled on starters, mains and accompaniments by the time the drinks arrived. The main meals are all seasoned with medium spices, but chilli heads can upgrade to hot if desired. 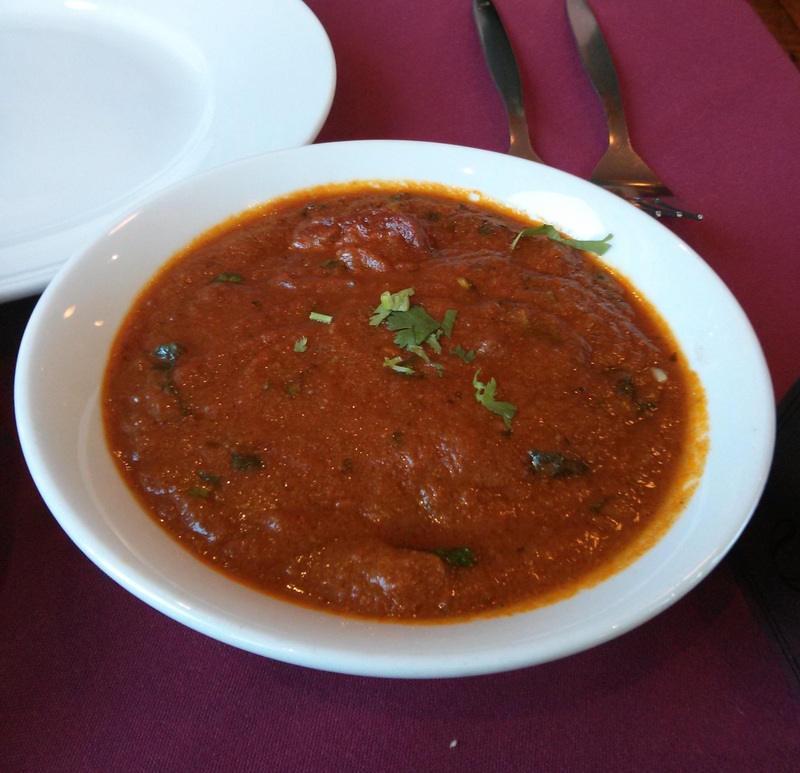 As this was our first visit to Kashmiri Kitchen, we played it safe and stuck with medium. The starters arrived promptly, and after a glance around the restaurant it became clear why: at 7pm on a Friday evening, there were more members of staff than customers. The waiters and waitresses were actually lined up against the far wall, waiting for something to happen. Good for us hungry and impatient diners, but I hope it got busier later on! We kicked off our Indian feast with two poppadom and pickle trays, which at £1.25 each were an absolute bargain. Each tray consisted of three large poppadoms, which arrived warm and weren’t in the least bit greasy or soggy, and a gravy-boat of mint and yoghurt dip. Our £2.50 also nabbed us a sharing platter of delicious mango chutney, an eye-wateringly tart lemon pickle, and a mix of seasoned onions and chopped tomatoes. A fantastic budget starter. 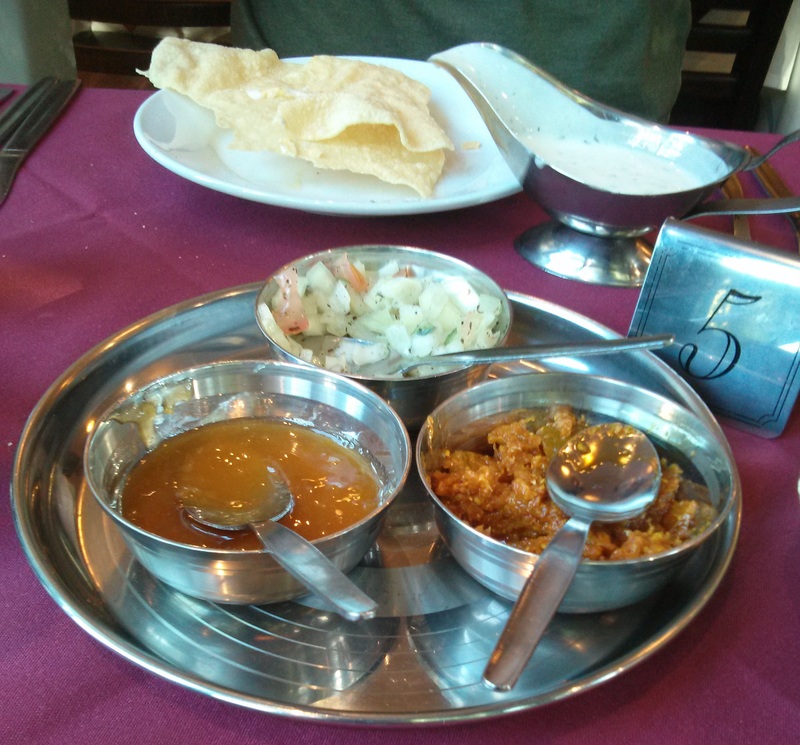 I was scrabbling after the last drops of moreish mango chutney when we were informed that our main meals were ready – or would we prefer to finish our starters first? As the poppadom and pickle paraphernalia already took up most of the table, we opted to finish off the starters first, which turned out to be a mistake. Although it only delayed our main course by 5 minutes or so, the mains arrived lukewarm, as though they’d been left cooling on the side the entire time. Thankfully, this was the only major issue with the mains. I love okra, so the Kashmiri Bhindi (£4.25) was my ideal meal: a bowl of perfectly-cooked okra. 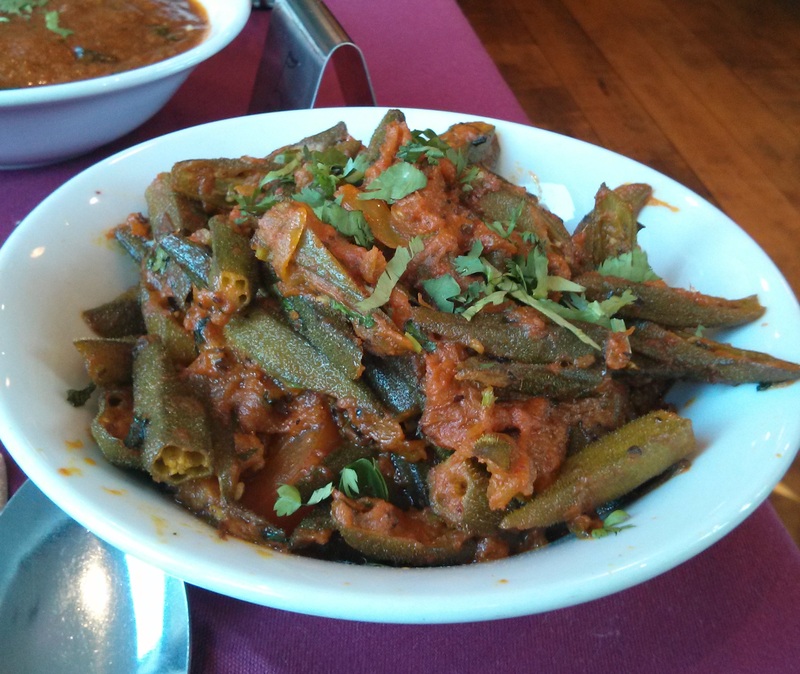 This veggie can sometimes go a bit slimy, but Kashmiri Kitchen got it spot on and served up okra that still had a nice crunch. The spices were deceptively tame at first, but the heat built up with every mouthful, and the spices had the depth of flavour you just can’t get from packets of chilli powder or jarred curry paste. Delicious. My only criticism is that, apart from two wedges of tomato and a sprinkling of herbs, the Kashmiri Bhindi really is just a bowl of okra, and some variation (a bit of onion or pepper, maybe) would have been welcome. At the opposite end of the table, the Gosht Handi (£5.95) may not have looked particularly appetising, but it was packed with juicy lamb in a rich sauce. Like the Bhindi, the spices were deceptive and built up to a nice warmth. 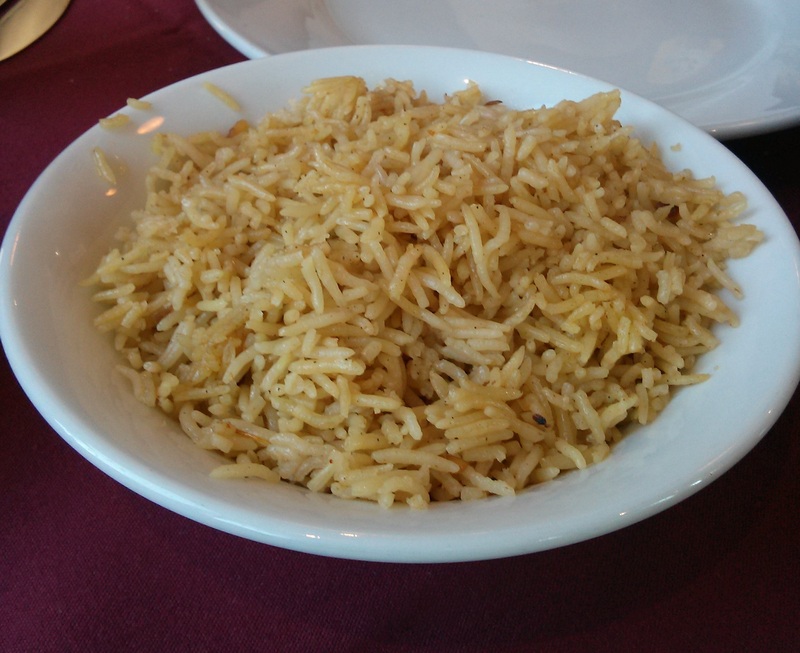 The final dish was a side order of fluffy pilau rice (£1.50) which was the perfect size to share. The portions weren’t enormous, but they left me pleasantly full rather than stuffed and guilt-ridden. In fact, I was eyeing up the dessert menu (the authentic-sounding Kashmiri style rice pudding was particularly tempting) but in the end I decided to save that for the next visit. You have to give Kashmiri Kitchen points for bucking the trend with their limited, unusual menu but it’s the prices where they really have the edge. If we’d been able to resist the call of the wine menu, the price for two starters, two mains and a rice side dish would have been a little over £14. The only major downside is that you’ll work your way through the menu in just a few visits, which will affect the number of times you’ll return to Kashmiri Kitchen. All in all though, this is good food at bargain prices. Definitely worth a visit if, like me, you’re in danger of getting into a bit of a rut when it comes to your spicy food.